I have an exciting opportunity to throw your way today. But first, a bit of the back story (or, you can just scroll to the bottom and read about the sneak preview). It seems I’m consistently having conversations with worship pastors and individuals who help lead worship at their local church, and ultimately these conversations end up focusing on which songs our churches are singing. We throw out a rearranged old hymn our church has enjoyed, or just the latest new song people have seemed to engage with. Most often, though, we end up sharing the same songs. I want people in my church to know the songs the church at large is singing, but I also wonder what we’re missing. Every church is singing songs by Chris Tomlin and Hillsong. But most churches don’t have the band composition to pull off those songs well. Why aren’t most churches singing songs by The Brilliance (one of my favorites) or by Sojourn Music (a church always rearranging mostly lost hymns of old)? The answer is because these bands don’t have the marketing budget. My friend and I have been working on a project that we think addresses some of these concerns. 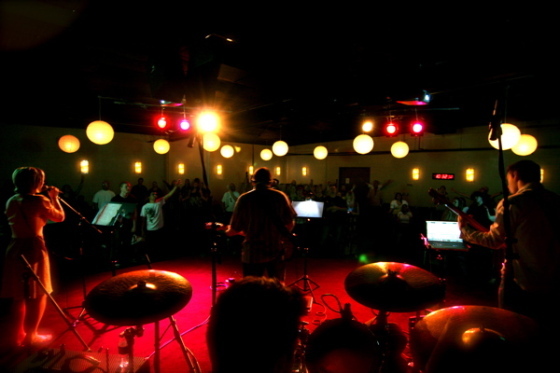 It gives space for small-name worship band to get their great music in front of people. It gives space for Chris Tomlin’s latest great song to be appreciated as well. The goal isn’t to kick out the big name artists, but it’s the put them on a level playing field with other quality artists and their songs. The goal in all this is for the church to sing more widely. Nearly all of the churches I’m in contact with have a severely limited set of songs their congregation knows. I want to see that expand. And we hope this website helps provide an easy way for people to find great music. So what does this mean for you? Sneak peek of what? For a couple weeks I’m giving you an exclusive preview of this website we’ve put together. No one else is going to know about this project. A small thank you for being a loyal reader. Vote up your favorite songs. Add some of your own songs to the mix. Give me any feedback you have.